Spicetronauts, rejoice! Spicy Gummy Peppers are an amazing candy confection that will have both your mouth and your eyes watering. Each pack includes three pepper-shaped gummies infused with actual jalapeño, habanero, or ghost pepper spices. But don't fear that these treats are all heat and no sweet! The delicious flavors of green apple (jalapeño), orange (habanero), and cherry (ghost pepper) are well-balanced in each and every bite. Over the years, Vat19 has become quite well-known for its stable of giant gummy products. We've also introduced "normie"-sized items like the gummy mustache and gummy shot glasses. But these Spicy Gummy Peppers are the first time we've busted out a gummy with this combination of sweet and spice! And we're glad we did because we love them! 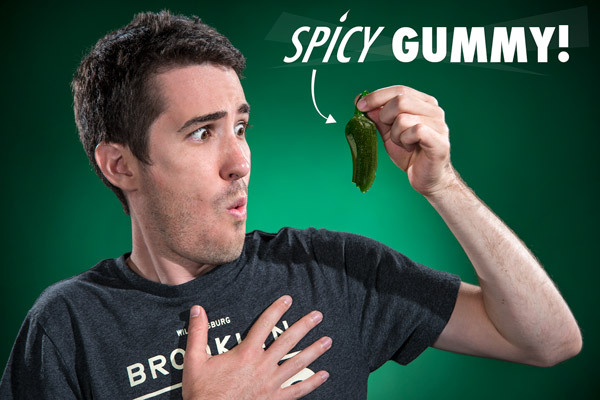 Spicy Gummy Peppers are packing the heat! Each 3-pack of Spicy Gummy Peppers includes one each of the following gummies: jalapeño, habanero, and ghost pepper. 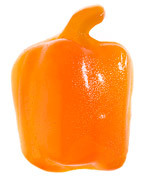 Each gummy is shaped like the pepper with which it has been infused. Most importantly, however, the spiciness never overwhelms the delicious sweetness of each gummy. 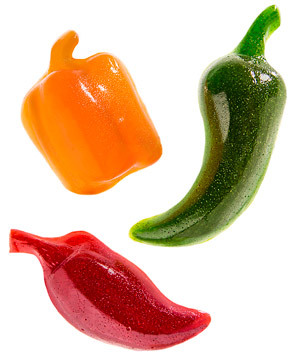 Each set of Spicy Gummy Peppers includes one each of the three peppers pictured above. As authentic as spicy candy can get! 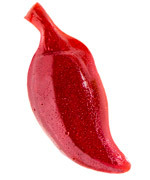 Each Spicy Gummy Pepper is infused with the spice for which it is named. The jalapeño has real jalapeño in it; the habanero has real habanero in it; and the ghost pepper, yes, is imbued with enough ghost pepper to make you sweat. 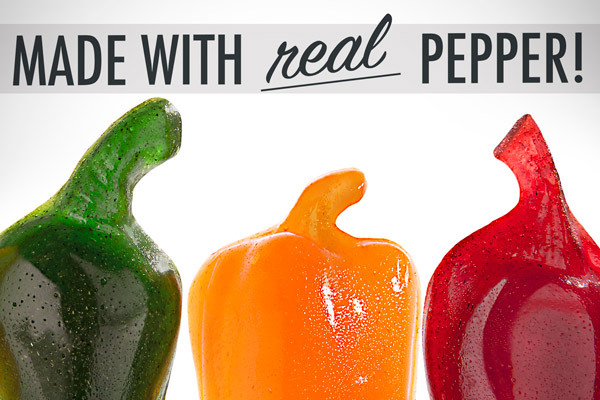 Each Spicy Gummy Pepper is infused with its respective pepper: jalapeño, habanero, and ghost pepper. Yes, that's ghost pepper! But you can do it! 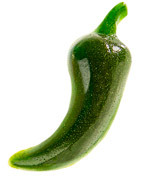 If jalapeño is mild heat and habanero is medium heat, then ghost pepper is the surface of the sun. Our recommendation is to take small bites, pace yourself, and have a bucket of milk nearby. Although your mouth will be hot, it won't be pure heat. The sweet flavor of cherry still comes shining through with each bite. 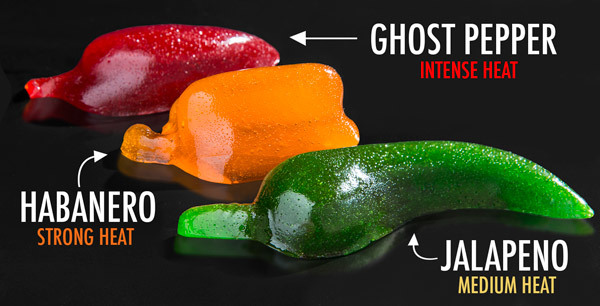 Do you have what it takes to wolf down the ghost pepper-infused gummy? Question: What are the ingredients and flavors of each? Answer: Check out the table below for the nitty gritty details. Jalapeño Green apple & Jalapeño Corn syrup, sugar, gelatin (pork source), ghost pepper and jalapeño powder, habanero oil, citric acid, sorbitol, natural & artificial flavors, FD&C red #40, blue #1, yellow #5 and #6, vegetable oil, carnauba wax, canola oil, lecithin from soybeans, water, rosemary extract. CONTAINS SOY. Question: What are the nutrition facts? Serving size: 40g; Servings per package: 3.7; Calories: 120; Total fat: 0g; Cholesterol: 0mg; Sodium: 10mg; Total carbohydrate: 29g; Sugars: 19g; Protein: 2g. Question: Is each gummy all spice or do they taste like gummy, too? 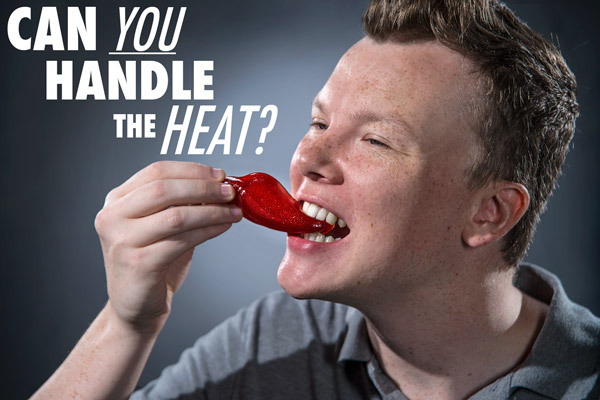 Answer: Each Spicy Gummy Pepper is deliciously flavored and is simply infused with the pepper that matches its shape. Jalapeño is green apple; habanero, orange; ghost pepper, cherry. Question: Do you have any other pictures of them that you haven't used yet that you'd like to show in this space? Answer: Why yes we do! Doesn't just looking at them make your mouth and eyes water? Question: Can I pick my peppers or can they only be purchased in a 3-pack? 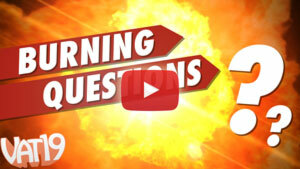 Answer: Spicy Gummy Peppers are only available in the 3-pack. It includes one each of the three peppers: jalapeño (green apple), habanero (orange), and ghost pepper (cherry). Variety is the spice of life, remember! So, buy, buy, buy!